Do healthy eating and the college lifestyle go together? Of course! The dining courts are filled with sensible eats – you just have to know a few basics about nutrition to make every meal a healthy meal. As a college student, we know you’re busy and don’t have the time to read book after book on nutrition. Simply follow this basic guide to ensure that your body is getting the right variety of foods each day. Meat and Beans 6 oz. A one-ounce serving is equal to one egg, one tablespoon of peanut butter, one-quarter cup dry beans, one-half ounce of nuts or seeds, or one ounce of meat, poultry, or fish. Fruit 2 cups A one-cup serving is equal to one cup of fruit, one cup of 100 percent fruit juice, or one-half cup of dried fruit. 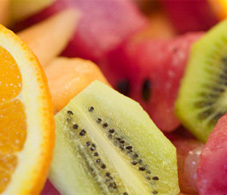 Fruits include all fresh, frozen, canned, and dried fruits, as well as fruit juices. Vegetables 3 cups A one-cup serving is equal to one cup of raw or cooked vegetables or vegetable juice, or two cups of leafy greens. Grains 7 oz. A one-ounce serving is equal to one slice of bread, one cup of cereal, one-half cup of rice or pasta. Remember, at least half of all of your grains should be whole grains. Milk 3 cups A one-cup serving is equal to one cup of milk or yogurt, one and one-half ounce of natural cheese, or two ounces of processed cheese. Oils 6 tsp. Oils include mayonnaise, certain salad dressings, and soft margarine. These guidelines are based on estimates from MyPyramid.gov. They apply to a 19-year-old who participates in 30–60 minutes of physical activity per day and eats approximately 2,200 calories per day. In addition, remember these four basic nutrition tips, and you’ll be on your way to making sensible eats a part of your daily life. Eat the colors of the rainbow in fruits and vegetables. Eat the things you like but in smaller portions. Self-denial may cause cravings and binge eating. Look up nutritional information now! NetNutrition is an online resource designed to provide you with the tools necessary to make healthy decisions when eating in the dining courts. New menu items are added to NetNutrition every week! The program, which provides you with comprehensive nutrition information on menu items in the dining courts, can be used to track your personal nutrition goals. NetNutrition allows you to group your food choices individually or as an entire meal. You can also track your choices throughout an entire day. For create-your-own items, such as pizzas at Earhart Dining Court and the various salad bars, you’ll be able to pull individual items from a complete list of ingredients to get the nutrition information.